Widely known for cosmetic and functional improvements in the smile line, both veneers and crowns each serve a unique purpose in dentistry. The highly desirable results delivered by veneers and crowns may serve to meet your smile goals individually or as part of a complete treatment plan, such as with full mouth reconstruction cases. Whether your specific smile goals are attained by veneers or crowns, or a combination of the two, receiving these cosmetic dental procedures from the esteemed Drs. Kayvon Javid and Mariam Nadi is sure to breathe new life into your smile and self-confidence. Teeth needing restoration from decay or damage often benefit from the strength, stability and cosmetic value of dental crowns. 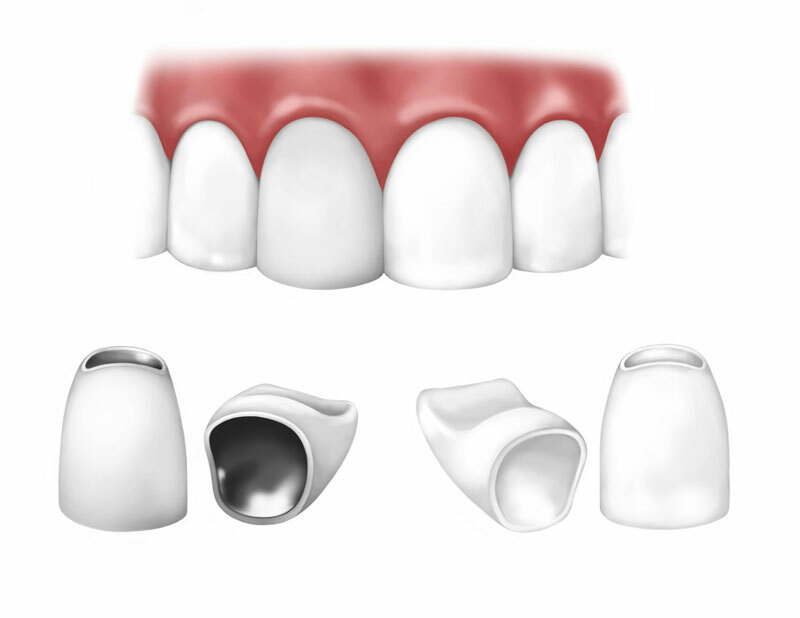 A dental crown is a cap-like piece covering the portion of the tooth rising from the gum line. Crowns are also used to cover and protect a tooth following root canal therapy and to restore a dental implant for tooth replacement. Today’s dental crowns afford the ultimate in convenience and esthetics, particularly with the implementation of CEREC® single-visit restorations. When teeth appearing in the smile line are affected by cracks, chips, uneven edges or deep stains, veneers may be recommended to create a balanced, brilliant smile. Veneers, typically crafted of porcelain, are customized restorations covering the outward facing portions of teeth visible when you smile, which for many includes canine to canine. Drs. Javid and Nadi gently prepares the surfaces of your teeth for a perfect fit and permanently bonds your veneers in place. Veneers are a highly cosmetic service ideal for building the smile of your dreams. Drs. Javid and Nadi have developed a meticulous approach and keen, artistic eye for designing bright, vibrant smiles for patients of all ages. Dr. Javid’s 15 years of experience, education with the University of Southern California’s elite Advanced Education in General Dentistry program and unrelenting insistence on incorporating the most innovative technology into our practice are what sets him apart as a leader in our field. Your oral health deserves the attention of an expert, one who has set his sights on giving you your best smile yet.